This route includes a journey through the Alps using the historic rail route through the scenic Brenner Pass. Waiting for the train at Bolzano (Bozen) station provides an idea of the scenery to be encountered with mountains on either side of the town. This part of Italy as known as the South Tirol with German spoken quite widely hence the bilingual station names. Bolzano station is in parts quite grand but the overall impression is that it is fairly unkempt with poor catering facilities. 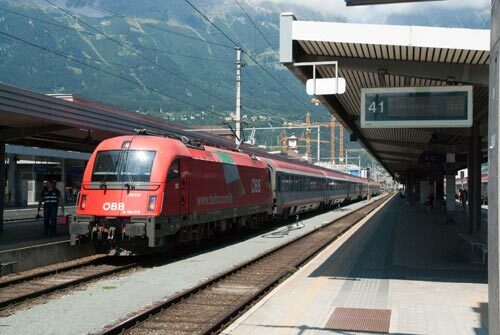 Photo - ÖBB 1216.018 (aka E190 018) stands at Innsbruck with a Munich to Milan train running in the opposite direction to the journey described. With departure of EC88, which originated in Milan and was heading to Munich, imminent at 1033, it was no surprise to see it was delayed by 10 minutes. Italian Railways still have not shaken off their inability to run trains on time and the railway must rank as one of the poorest in Western Europe. Shabby trains and locomotives, many covered in graffiti, together with a laissez-faire attitude towards the time provides most visitors with a negative view of their railways. While you are waiting on the platform you have time to consider your strategy for getting a seat on the left hand side of the train facing the direction of travel as this is the side from where the best views can be enjoyed. Eventually the train appeared some 18 minutes late obviously having been delayed by a shabby all stations stopping service that was running late. With ÖBB 1216.019 at the head of the train and a rake of Austrian coaches there was promise that the onward journey would be improvement on what seemed to be available in Italy. Poor station operation meant that an 18 minute delay soon became 25 and we rattled out of Bolzano into a narrow steep sided valley flanked by hills. As with many railways through mountains you soon enter a tunnel and might wonder how much of the journey is to be accomplished in daylight! However you are soon out in the open and speeding towards the first stop at Fortezza where there is single track branch to San Candido on the right. Here you might see one of the brightly painted modern electric units operated by SAD who run services between Merano, Bolzano, Fortezza and Brennero together with the branch to San Candido. More loss of time at Fortezza and we are off again with the valley now broader and the views more extensive. Even in early August there are patches of snow on the higher peaks. Running parallel to the railway is the main motorway through the pass and this can be seen crossing some spectacular modern viaducts. As far as the railway is concerned it relies on clever engineering to climb steadily into the pass with many tunnels and bridges together with some tight curves making relatively rapid progress possible. The next stop is Brennero which is the border station with Austria. Here you see modern Austrian units working the stopping trains to Innsbruck. There is also likely to be freight activity here with trains of piggy-back trucks and containers forming the bulk of the traffic. Motive is varied from Italian and Austrian motive power through to locos from open access operators and other European state systems. With an Austrian crew now on board we made up a few minutes at Brennero and were soon speeding downhill towards Innsbruck. Again the scenery is good with the area having many Tyrolean features. Approaching Innsbruck look out to the left and you should see the impressive ski jump and for the railway enthusiasts on board you pass the main loco depot on the right. Innsbruck station has an air of efficiency and the station staff are keen to make up some lost time by dispatching the train quickly and now only 17 minutes late.